It all started in 1924, when Edwin Hubble proved galaxies are very distant objects, each containing millions or billions of stars, bound together by gravity. 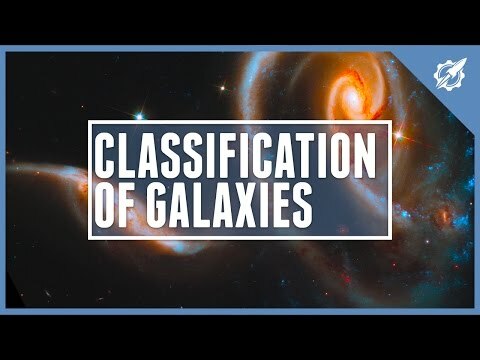 Within a few years, he set up a system to classify these galaxies by shape; a system which is still pretty much the system we use today. Elipticals are marked with the letter E, sub-divided 0-7, where 0 is completely round and 7 is very elongated and flattened. The contain many old stars with very little dust between them. As stars form from dust, that kind of makes them dying galaxies without the raw ingredients to form many new stars. There are Regular spirals (S) and barred spirals (SB). About 2/3 of spiral galaxies have a bar, probably including our own Milky Way. Spiral galaxies are sub-divided A-C where A has spirals tightly wound around the central bulge and in C the spirals are very loose. They have a mixture of old and new stars, which are particularly created in their spiral arms. Irregulars have a disk around a central bulge, but no obvious dust lanes. The have no sub-divisions. They often have many bright young stars. 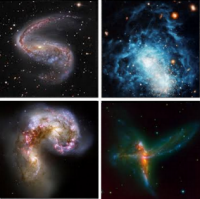 Galaxies can change their shape over time through interactions, collisions and mergers. These interactions stimulate massive star formation. If you're thinking that irregular galaxies have been messed-up and shaken-up by this kind of interaction, you're on the right track. The Milky Way is a large galaxy (although there are many both larger and smaller). There are also Dwarf galaxies, like the near-by Small and Large Magellanic Clouds. Astronomers think that the total mass of all Dwarf galaxies exceeds the mass of the Large galaxies. 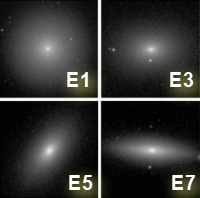 Changes to Hubble's galaxy classifcation system consider brightness, and whether arms spiral outward from a ring of stars. These changes help astronomers to understand more about their birth and eventual death.